Responsive sports handling with maximum comfort - for high performance vehicles: Enhanced acceleration and braking, superb handling and safety on wet, greater stability at high speed plus comfort and durability. The SP Sport 9000 delivers technology and performance for the enthusiast looking for the very best. 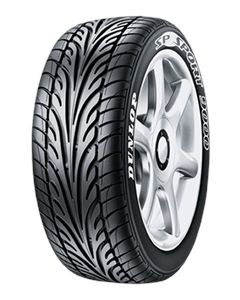 The Dunlop SP Sport 9000 features a distinctive 'sweep' directional tread design that sluices water away like a turbine wheel, while the silica tread compound promotes amazing wet weather traction and reduces rolling resistance. It's available in a variety of sizes to fit local and imported exotic and performance cars. Sorry, we currently do not have any tyres with the SP SPORT 9000 pattern in stock.